What Tastes Better, Machine-Made Or Hand-Made Sushi? When it comes to Sushi, many people claim The Color of the Tea that it is an acquired taste. Either you love it or you don’t. However, everyone unanimously agrees that the best sushi is hand-made. There’s no competition about that fact if you ask any gourmand about it. In fact, Japanese cuisine tends to glorify this aspect; a chef has to train for years under gruelling conditions just to be able to master the knife to slice the fish into the perfect, clean, bite sized pieces. It takes them more additional years to be able to master rolling and moulding the rice. Luckily, this insane attention to detail pays off. No one can deny how good the sushi by these practiced chefs turns out to be. On the other hand, the better the sushi, the more the cost is. This spells disaster for the average consumer who loves sushi. Stuck between having not enough to indulge their sushi habit and not enough skills to make their own sushi at home, it can be quite a big task. Moreover, for restaurants, this also spells disaster as having a highly trained Japanese chef on board can require stretching out their budget. 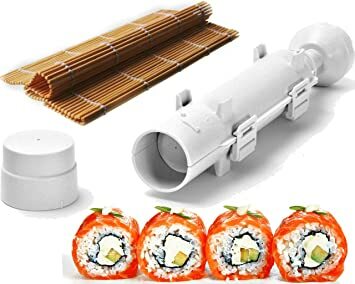 Prepare sushi within minutes – With the rolling and preparing of the rice being done by the machine, you no longer have to spend hours working on the sushi. More Options – Making sushi on your own becomes easier as you can indulge in more different techniques. Cost Effective – Any learning chef knows the dangers of making errors while cooking. With a sushi machine, you don’t have to worry about wasting the expensive ingredients you purchase. Ease of Use – It isn’t complicated to use sushi machines. Following the instructions, all you have to do is pop the ingredients in it and have them turn out completely transformed into eatable sushi. SushiMachine.com.au is also becoming popular as they are a worthwhile investment and more cost effective in the long run. The best part about sushi-rolling machines is that there is no difference between the taste of hand-made sushi and machine-made sushi. For restaurants, it has long been a popular gimmick to amplify the importance of hand-making sushi since it allows them to charge more with ease. When you’re eating in a restaurant, you’re paying for the experience along with the food. On the other hand, why pay more when you can save more and eat more? With sushi machines, you can indulge your sushi habit with ease without having to compromise on the overall quality. Nowadays, when everything is becoming automated, it just makes more sense that sushi rolling is becoming automated as well. Moreover, with no depreciation in quality, it is worth the investment.